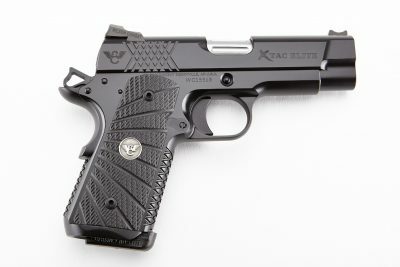 The new X-TAC Elite from Wilson Combat offers shooters an enhanced and upgraded version of the X-TAC series of pistols. To learn more, visit http://www.wilsoncombat.com/. 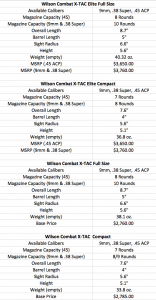 To purchase a Wilson Combat X-TAC on GunsAmerica.com, click this link: https://www.gunsamerica.com/Search.aspx?T=X-TAC. I have never made any effort to hide my strong fondness for John Browning and his greatest creation. The number of 1911s in my safe, both personally owned and those on loan, is well into double digits. In 1971, while still in high school, I purchased my first 1911 pistol and, since that time, the inventory has continued to grow. Over the years, my affection and appreciation for the 1911 has grown as has my skill and proficiency with Browning’s masterpiece. In 35 years of writing, I’ve become friends with many of the leading gunsmiths to include Jason Burton, Stan Chen, Bill Laughridge and Dave Williams. However, one of the relationships I value the most is with the folks at Wilson Combat. I have had the opportunity to evaluate over a dozen guns from Wilson, and the quality, fit, and finish never disappoints. For many years, a Wilson Combat CQB was on my list of pistols to add to my daily rotation. I never got around to ordering one and at this time, and I’m glad I put it off. In my mind, there is a new king and that is the X-TAC Elite. 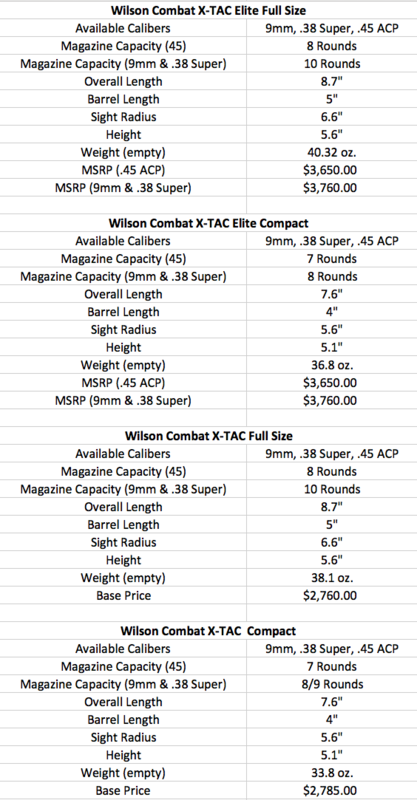 Prior to the introduction of the X-TAC in 2010, I received a call from Wilson Combat asking if I would like to review a new model. I was a little “ho-hum”; after all, how much more can you do that has not already been done? But, the opportunity to shoot a new Wilson is not something that I dared turn down. The new model was the X-TAC and was originally designed to be an “entry level” pistol. The name came from the “X” pattern on the front strap and the TAC was short for “Tactical.” Because the new pattern was not as time-consuming as checkering, the X-TAC’s price was slightly less than the CQB. 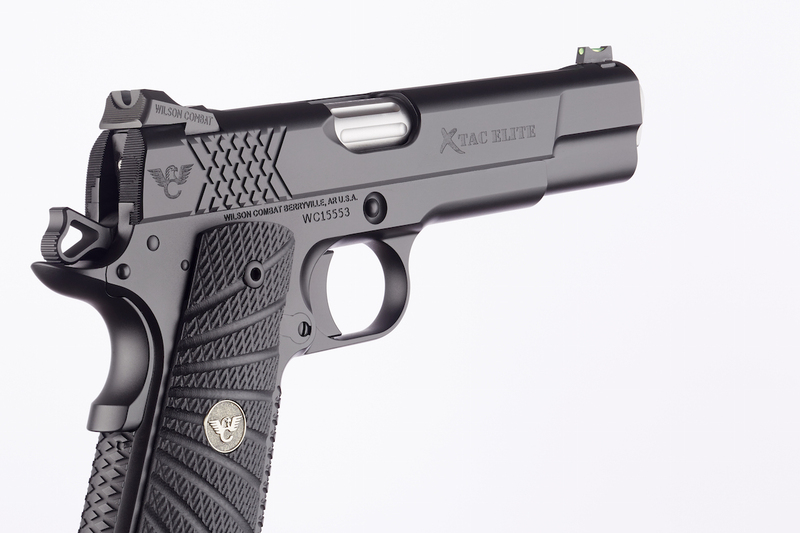 Wilson Combat is renowned for its attention to detail, and the X-TAC line is no exception. Images courtesy Wilson Combat. Offered in both a full-size, 5-inch government model, and a compact size, the X-TAC quickly became a best seller for Wilson Combat. At its heart, the X-TAC retained all of the quality and strength that made Wilson Combat pistols some of the most sought after on the market today. There are no shortcuts taken in the X-TAC production. 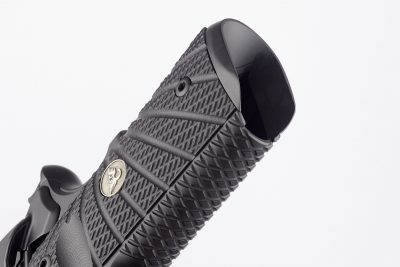 The X-TAC texturing consisted of a large “X” pattern that was machined on the front strap, mainspring housing, and the cocking serrations on the rear of the slide. The wide lines of the “X” cuts created a series of flat-tipped diamonds that grip the hand. The pattern was bi-directional and offered improved traction without the need for any sharp edges. To complement the pattern, the X-TAC was equipped with a set of G-10 stocks that had the, now familiar, Wilson Starbust design. The combination of the stocks and the “X” treatment provided a positive gripping surface that did not snag or abrade clothing and was quite appealing to the eye. The author used a Raven Concealment rig with the Wilson for testing. The operating controls on the X-TAC consist of Wilson’s Bullet Proof Slide Stop, a single side Tactical Thumb Safety, and a Bullet Proof Grip Safety and hammer. The front strap is relieved at the base of the trigger guard and allows for a higher purchase on the pistol. This feature, when combined with the high cut grip safety, allows the X-TAC to sit lower in the hand. The trigger is a standard three-hole aluminum unit that is equipped with an adjustable over-travel stop. 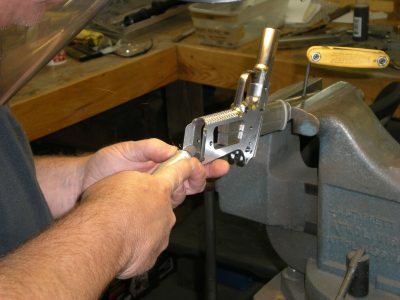 The edges of the mainspring housing are perfectly blended to the frame and the base of the mainspring housing had been rounded. All of the edges are broken and the pistol is finished in a Wilson’s black Armor-Tuff finish. The original X-TAC had that “bar of soap” feel that epitomized a clean carry gun! 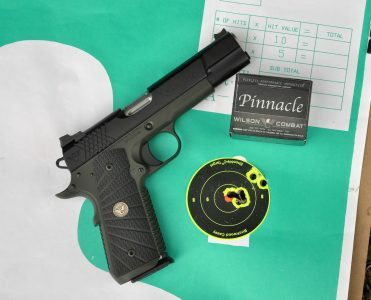 Wilson also chose to use the X-TAC to introduce their new 1911 Battlesight. The rear sight retains the familiar Wilson profile but is slightly higher and featured a .145” “U” notch. The rear of the sight blade is serrated and the actual notch has been recessed into a semi-circular pocket. During range time, I found that this combination reduced the glare on the sight blade and provided a rapid and crisp sighting plane to locate the front sight. Wilson selected a fiber optic light pipe in the front sight. The X-TAC came with two Wilson 47D, eight-round, stainless magazines, a test target, inspection sheet, and an instruction booklet. The X-TAC was assembled on the same production line as the other models and subject to the same quality control, inspections, and testing. The E-Tac Elite line also includes a Compact variant. On the range, the X-TAC ran like a top with every .45 load I could find. Even in the 95 degree Georgia heat, the “X” pattern kept the pistol secure during presentations and drills. During range drills, the fiber optic front sight was appreciated by all of those who shot the X-TAC. The bright green dot was easy to find during the draw stroke and follow-up shots. The trigger broke cleanly at 4 lbs which is ideal for a personal defense 1911. Wilson guarantees that the X-TAC will shoot a 1” group at 25 yards. While I was unable to bench rest the X-TAC, I have no doubt that it will meet these standards with the proper ammo. The following year, I had the opportunity to visit Wilson Combat in Berryville, Arkansas. 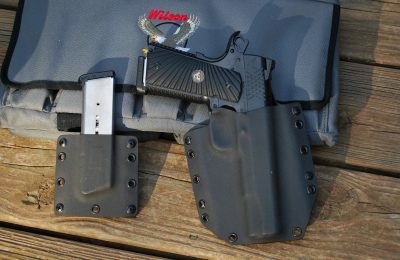 Wilson had just introduced the X-TAC Compact and, being a fan of compact 1911s, I was anxious to wring it out. As with the full-size pistol, the Wilson Combat X-TAC Compact is based on Wilson’s standard compact steel frame, slide, and quality bullet proof parts. 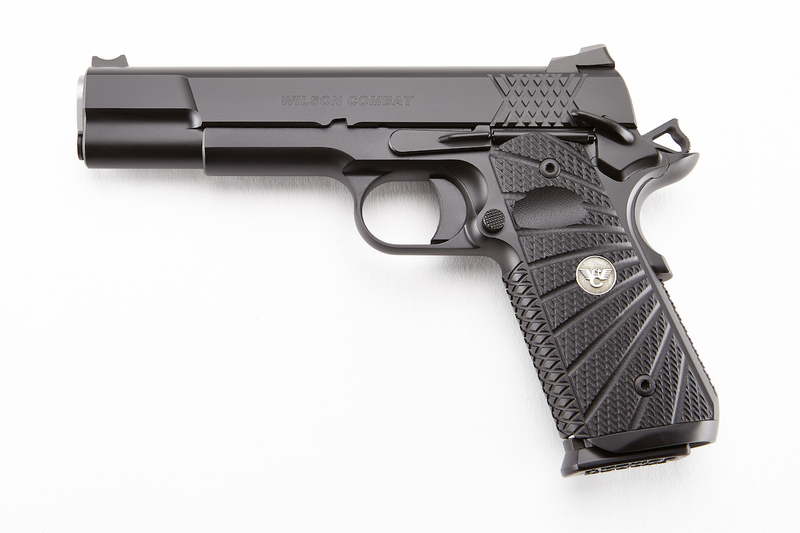 The compact model featured a slide that is 1-inch shorter than a full-size 1911. A 4-inch, match grade, bull barrel is fitted to provide match grade accuracy. The frame on the X-TAC is ½-inch less than a full-size 1911. As the writers gathered at Bill’s backyard range, the X-TAC Compact was the first pistol I shot. Ringing steel at 50-yards with a pistol was never more fun! Several months later, I received a X-TAC Compact for a full review. As with every other Wilson I have evaluated, it was as close to perfection as possible. As much fun as I had with the 5-inch and Compact X-TAC, both wound up being returned to Wilson. More than once, I had “return remorse” and wished I had found a creative way to purchase one or the other, or both! But as writers say, “you can’t keep everything!” My interest in the X-TAC was rekindled when Wilson introduced the Wilson X-TAC Elite series of pistols. I was fortunate enough to receive one of the first full-size X-TAC Elites to go out the door. The pistol exceeded my expectations and addressed the few items that I found lacking on the original X-TAC. Note the integral magazine well and x-pattern grooves on the front strap of the pistol. Images courtesy of Wilson Combat. 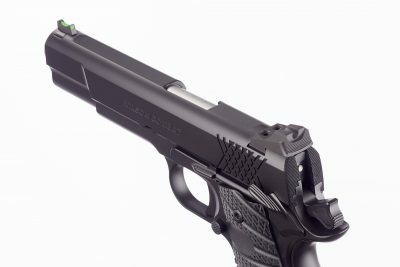 The pistol comes with Wilson Combat’s BattleSight that features a U-shaped notch rear unit. The Elite series of pistols is an upgraded version of the X-TAC, while retaining the same quality components as other Wilson pistols. The upgrades are impressive and make the X-TAC Elite ideal, from both a functional and esthetic viewpoint. The slide on the Elite series has been substantially upgraded with carry cuts and ball endmill cuts. This treatment gives the Elite a sleeker and more modern appearance than the traditional, slab side, 1911. In addition, the top of the slide has been flattened and serrated with 30 lines per inch. The rear of the slide has received 40 LPI serrations that correspond with the blade of the rear sight. The bottom of the slide has been heavily chamfered as well. The Wilson X-TAC Elite is a lot of pistol for serious shooters. It may be expensive, but it delivers. The frame has also received a number of upgrades. The three-hole trigger has been replaced with a medium-length solid trigger. The slide stop has been countersunk and the slotted grip screws have been replaced with torx head screws. The most significant upgrade is the addition of Wilson’s Bullet Proof one-piece magazine well. The mainspring housing has the X-TAC texturing and has been round butted. The magazine well has been evenly blended to the frame, both internally and externally. Wilson also replaced the standard hammer and beavertail grip safety with their Concealment models. The Concealment grip safety has a lower profile and is shorter in length than the standard model. The spur concealment hammer has also been reduced to fit the concealment beaver tail. The final upgrades involve the barrel. Where the standard X-TAC barrel and bushing has a typical GI profile, the Elite model has a flush cut, reverse crown. This deep crown is both pleasing to the eye and serves to protect the muzzle from impacts. The edges of the bushing have been beveled and the exterior of the chamber has been fluted. As with the original model, the X-TAC Elite comes in .45 ACP, 9mm and .38 Super. The x-pattern theme on the X-TAC Elite pistol is carried over to the slide serrations at the rear of the slide. When I saw the press release for the X-TAC Elite, I immediately put in a request to have a gun sent for evaluation. The pistol arrived in the now-familiar gray Wilson Combat pistol case. Our test pistol was finished in black over FDE Armor-Tuff coating, and at my request, was chambered in 9mm. I requested a 9mm model due to the wide variety of ammunition I had on hand. I also wanted to wring out a 5-inch 9mm after hearing my friend, Ken Hackathorn, talk about how well they shot. I was not disappointed. 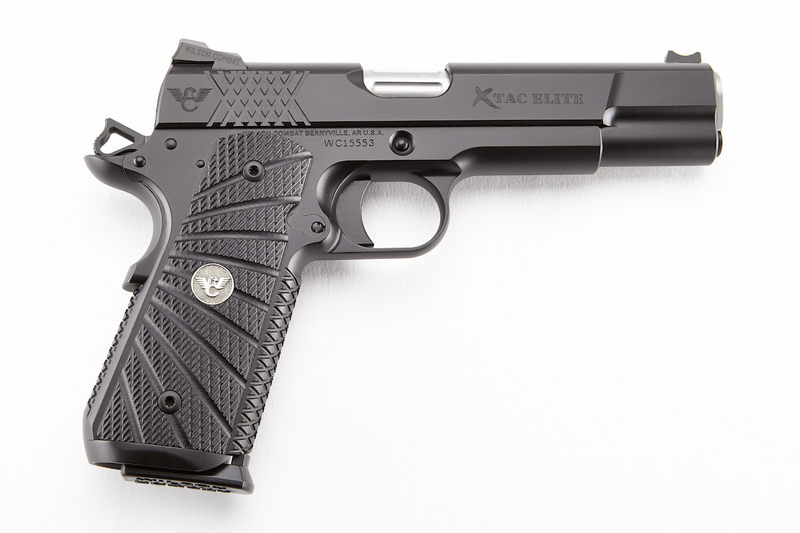 The initial examination found the X-TAC Elite as eloquent and classy as every other Wilson Combat pistol. The frame to slide fit was void of any play and the slide opened and closed like the door on a Mercedes G-Wagon. The barrel lock-up was smooth and seamless and the trigger broke cleanly at 3 pounds, 13 ounces. The beavertail, when depressed, was nicely blended and contoured to the edges of the frame. The author ran a variety of ammo through the 9mm X-TAC Elite he tested, including Wilson’s own Pinnacle offering. On our first range trip, I took both the X-TAC Elite and a second custom 1911 that is the subject of another review. With the temperatures in the upper nineties and humidity close to 80%, it was perfect conditions to test the X-TAC pattern. When compared with the 20 LPI checkering on the second pistol, the X-TAC proved every bit as secure while being less abrasive to the palm. The fiber optic Battle Sight proved very easy to pick up for both initial and follow-up shots. The wide mouth of the magazine well made for extremely fast reloads. The X-TAC Elite was 100% reliable with all of the loads we tested along with several boxes of Aguila 115 FMJ. The fact that the pistol ran with everything, from a 65-gr. frangible running at 1,601 fps to a 135-gr. subsonic load running at 969 fps, was impressive. Accuracy testing was done from 25 yards, using a seated position, with my back braced on a barricade. I used a ten-shot string and measured the best five shots for the accompanying chart. I did find that the fiber optic, while being highly visible, proved to be a handicap when attempting to shoot tight groups at a distance. The 9mm X-TAC was just outright fun to shoot and the ammunition allotment went entirely too quickly. In short, the X-TAC Elite is as perfect a 1911 as I have tested. Having shot a .45 for over forty-years, my hands have taken a beating. I can no longer run 500 rounds in a day and not pay the price in the evening. The 9mm X-TAC solved that problem and is the best of all worlds. Ideally, I would follow the recommendation of Hackathorn, train mostly with a 9mm and carry a .45 ACP model for serious social occasions. That would require owning two X-TAC Elites which would not hurt my feelings, only my checkbook. Then there is the new X-TAC Elite Compact that opens up an entirely new possibility. 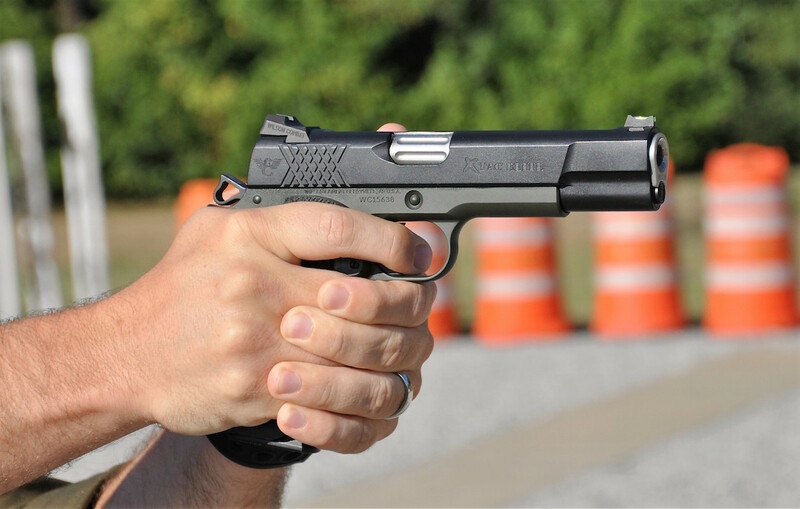 The Compact is available in all three of the calibers that the full-size gun is offered in. The Wilson X-TAC Elite is a great range or carry pistol right out of the box. Image courtesy of Wilson Combat. I bought my CQB compact about 10 years ago and love it! Love it even more when I see how much more expensive they’ve become. Business is business but how do you improve on a nearly perfect pistol? Buy the best you can afford.Practice,Practice and Practice Many expensive guns become safe queens and conversation pieces. I know many of those people who have these prize guns. Is a Rolex any better than a Timex watch? They both tell time within a small variable factor.The choice is yours to make.Good shooting. Entry level? For $3+ grand ??? Really? I am a huge 1911 fan, but believe me, I can go have a custom STI 1911 built that will run just as well for under $2,000.00 easily. For less than $1500.00 I can get somebody like Alex Hamilton or Benny Hill to take any Springfield or Kimber and make them just as reliable and accurate. Sorry, but most folks have to work two jobs to pay for Obamacare and simply cannot afford a $3000 “entry level” gun from Bill Wilson. I still have my Wilson Protector in .45 ACP. Yes, I shoot a lot of 9mm, because is cheaper, but John Moses Browning 1911 is my go to gun for self preservation. As to the other poster, Google ‘Wilson Combat’ to get all their contact info. Or maybe send them a self-addressed stamped envelope and they’ll mail you a catalogue. 9mm? I just don’t know, but as I get older it seems to me some trend in weakness is settting in, I am referring to comments and complaints about recoil, whether it be a rifle or a pistol. I myself do not understand it? True different guns have different degrees of recoil, but I am believing the real reason is softness within the public. One study indicated that the average male is 30 percent weaker then their fathers, I did not see any figures for females. I watch many who shot a 45 ACP for the first time and the first comment typically is , ‘oh the recoil!’ Same with .308’s. What ever happened to adapting and learning? The only reason I even see the 9mm pushed over the .45ACP so much was the changes around the world and more women having to carry a firearm. Yet I have seen many women carry and shoot .45’s with no issues. I have both calibers and I typically conceal carry the H&K 45 compact. I prefer it over my Kimber Uktra Carry, Springfield Armory XDs or XDm 45’s I would really prefer to carry the FNS 45, even over the HK but it can get to be a bit much to conceal. I will however say the HK and FNS in 45’s are damn fine guns. Nails drivers. Maybe it is due to my age, but I for one see an overall weakening of our society. One comment I try to tell many is that if something catastrophic happens, many folks will just not survive. Too weak and use to to much “Nanny State” within their lives.